As the heat rises in the valley of Northern California, my anticipation has been growing for the first local ripe tomato. The key word here being “local.” As a kid growing up in Southern California, I ate tomatoes year-around from the grocery store. As an adult I moved to Northern California and was exposed to a variety fresh local produce. It was this exposure that convinced me I never truly tried a real tomato! Fresh, warm tomatoes off the vine are completely different than store-bought ones. They are more savory, yet sweet with a delicate texture (not grainy like store bought). In fact, I believe there is such a difference I no longer buy tomatoes from the grocery store. How is that for being loyal to the local tomato? Each time I go into my small garden I look for the ruby color among the green plants. No luck! I have been going to the farmers market, hoping our local farmers are having more success than I have. Also to no avail! Just give me a fresh tomato!! Then it happened, yesterday I laid eyes on the first tomatoes of the season! I could hear the angels above singing “Hallelujah! Hallelujah! Hallelujah!” Even though the summer solstice is in a couple weeks, to me summer has now officially begun. Aside from tasting delicious, tomatoes are also packed with vital nutrients to help your body operate in tip-top shape. Tomatoes are most notable for their high carotenoid content, with lycopene taking the cake. These antioxidant compounds have been shown to reduce cancer risk, obesity, and heart disease. Although you could take carotenoids as a supplement, they work better when they are in a whole food form such as a tomato because of the synergistic properties with the other food compounds. One of my favorite ways to eat tomatoes is right off the vine. I enjoy cutting them and tossing them in cottage cheese with black pepper as one of my “go-to” summer snacks. If I have more time I will make a simple caprese salad which includes fresh tomatoes, extra virgin olive oil, basil, fresh mozzarella, and balsamic. It is heavenly and an excellent appetizer too! If you are looking to dedicate a little more time to your tomato concoctions here are some ideas on how to use those fresh tomatoes from your garden or the farmer’s market! Who does not love chips, fresh salsa and a cold beer on a hot sunny afternoon? Even “tomato haters” end up enjoying this combination with friends during the summer months. All of the ingredients in fresh salsa can come straight from your garden or found at your local farmers market: cilantro, onion, jalapeño, peppers, garlic and lime. When you make a big batch you can add it to tacos, scrambled eggs, beans, or salads for a boost of flavor and nutrition. Here is a recipe from Kim’s Healthy Eats for a simple fresh salsa. Did you think we were going to get through the list without mentioning pasta? Yeah right! If you are looking for an easy, light summer dinner, then pasta pomodoro is where it is at! This dish allows for the true flavor of the tomato to come through and is nicely accented by garlic. Many pasta pomodoro recipes are vegetarian but I like to include shrimp in mine to add a balance of protein. I always recommend cooking pasta “al dente” to help lower the glycemic index, plus it is the traditional Italian way of cooking pasta 😉 Recently I came across this recipe from Pinch Of Yum and have been dying to try it. It looks similar to the one I prepare but I use extra-virgin olive oil instead of the butter. Maybe next time I will try half and half…. Did you know you can make your own tomato paste? Who knew, right? My whole life I have purchased tomato paste in a can because I thought it was the only way. But then my mind was blown when my neighbor told me she was in the process of preparing her own tomato paste from fresh tomatoes in her garden! It can be time consuming but apparently it is super easy! All you need is tomatoes, a good blender, a strainer and an oven. I like to add tomato paste to tomato sauces and soups to add a bit of sweetness without extra sugar and extra nutrients. Here is a link from Revived Kitchen to make fresh tomato paste that you can use throughout the year! For the more adventurous cook, why not try fermented ketchup? It can be a unique way to use up your tomato paste and has beneficial bacteria in it for your gut. It still maintains its sweetness but has a slight tang to it and can be used all the same ways you use ketchup. Plus, it can be good conversation starter 🙂 If you have been following my Instagram page you may be able to tell I have been on a fermenting kick lately. Lots of trials and errors ? 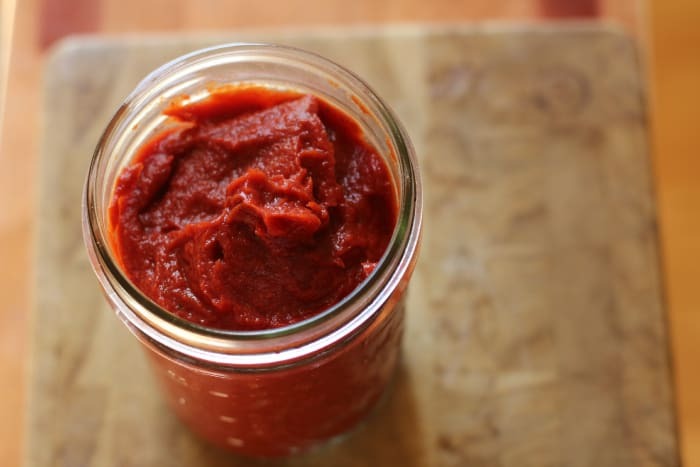 This fermented ketchup recipe from The Prairie Homestead is a great starter recipe for those looking to enter the world of fermentation. Have fun! With that I am signing off to go enjoy some of my fresh tomatoes. Please share with me some of your favorite ways to eat tomatoes?